There are many issues with putting semi-autonomous cars on the market, not the least of which being customers not understanding what “semi” means and car companies outright adding to that confusion. But the worst part might not be the people who misunderstand it—it might be the people who do. We at Jalopnik debated sharing this video, because it’s an unsafe method of tricking an imperfect system that requires constant human supervision. But it shows how imperfect our current semi-autonomous landscape is. That and since it’s floating around the top of /r/Videos at the time of publishing, plenty of people have already seen it, for better or worse. “Tesla Autopilot Trick,” the post reads. Autopilot is Tesla’s semi-autonomous driving system, which is able to control the car under human supervision. It isn’t perfect. The technology has caused cars to smack into a road barrier, and was running in the fatal crash that killed Joshua Brown in 2016. The driver in this video said he’s “not going to recommend [tricking Autopilot] for everybody,” but it’s not enough. It wasn’t a smart thing to do, and it wasn’t smart to share it. He said he was wide awake and cruising in the “middle of the desert,” which he found to be enough justification to do this in the first place. There were other cars around and the Model S was riding in the passing lane. Having imperfect, semi-autonomous technology on roads has enough potential for danger without people trying to trick it, and tricking the system can make a person more comfortable ceding an unwarranted level of control to the car. 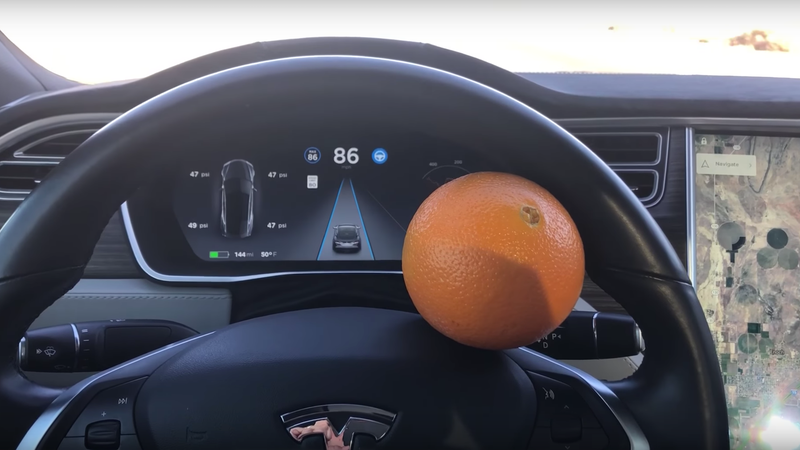 Don’t stick an orange in a steering wheel because it seems like “a thing of beauty” when you’re bored on a long road trip, and certainly don’t pull out your phone and start distracting yourself from the road. That’s the whole point of Tesla making you grab the wheel in the first place.